I like to have a little garden. I always plant a few pumpkins for the grandchildren. This year the pumpkins produced so early that I don't think they will last until Halloween. I've had them in the basement for almost a month now and so far they are still OK. Next year I'll wait until the first of July to plant them. Smile today; tomorrow's another day! Good luck with your pumpkins, Orin! _The Pumpkinification of (the Divine) Claudius_ or _Apocolocyntosis (divi Claudii)_ is a political satire on the Roman emperor Claudius, probably written by Seneca the Younger. It is the only example of Menippean satire from the classical era that has survived. The title plays upon "apotheosis", the process by which dead Roman emperors were recognized as gods. The title Apokolokyntosis ("Pumpkinification") comes from the Roman historian Dio Cassius, who wrote in Greek. Dio Cassius attributed authorship of a satirical text on the death of Claudius, called Apokolokyntosis, to Seneca the Younger. The work traces the death of Claudius, his ascent to heaven and judgment by the gods, and his eventual descent to Hades. At each turn, of course, Seneca mocks the late emperor's personal failings, most notably his arrogant cruelty and his inarticulateness. After Mercury persuades Clotho to kill the emperor, Claudius walks to Mount Olympus, where he convinces Hercules to let the gods hear his suit for deification in a session of the divine senate. Proceedings are in Claudius' favor until Augustus delivers a long and sincere speech listing some of Claudius' most notorious crimes. Unfortunately most of the speeches of the gods are lost through a large gap in the text. Mercury escorts him to Hades. On the way, they see the funeral procession for the emperor, in which a crew of venal characters mourn the loss of the perpetual Saturnalia of the previous reign. In Hades, Claudius is greeted by the ghosts of all the friends he has murdered. These shades carry him off to be punished, and the doom of the gods is that he should shake dice forever in a box with no bottom (gambling was one of Claudius' vices): every time he tries to throw the dice they fall out and he has to search the ground for them. Suddenly Caligula turns up, claims that Claudius is an ex-slave of his, and hands him over to be a law clerk in the court of the underworld. Ann wrote: Good luck with your pumpkins, Orin! "Pumpkinification"; Apotheosis http://dictionary.reference.com/browse/apotheosis! OK; I learned a new word! OK; I learned a new word! I love pumpkins! And pumpkin "stuff," too: pumpkin bread and pumpkin cookies and pumpkin ice cream and pumpkin pie, and so on. We don't carve our Halloween pumpkins; we draw on them instead, and then leave them out front to gently fall apart/be munched on/become one with the earth. A few years ago, I found a couple of volunteer pumpkin vines growing in front of my house. One was in the bushes off to one side; the vine grew up, over, and into a yew, dotting it with creamy pale orange blossoms. These blossoms were a lovely contrast to the deep green of the yew. The other vine was in the wasteland that is supposed to be a front garden, a patch of soil between the sidewalk and the house which is entirely under the soffit; protection from the rain makes the patch more suitable perhaps to prickly pear than to pumpkin. But no matter! This vine grew along the house, then wound its way around the corner and headed for the side door (but didn't quite reach it). One morning as I left for work, I was astonished to see a pumpkin! I always looked at the vine when I walked along the front sidewalk, so I cannot account for never having see this pumpkin until that morning, but I hadn't: it was as though someone had simply placed a fully-formed pumpkin on the splash block. About a week later, I saw another pumpkin! It had not been there a week before -- I swear it just materialized! Neighbors talked to me about the pumpkins; they were watching them grow, checking them out as they walked by, the one on the splash block being particularly noticeable from the street. One of these pumpkins became one of our Halloween pumpkins that year; the other rotted from beneath, so eventually enriched the soil rather than be harvested. Even into the next year, I would get comments and questions about the pumpkins. I've had the occasional volunteer vines both before and since, but that was the only year I got pumpkins out of them. When I first started growing pumpkins in my back yard; I didn't know that there was a difference between the male and female flowers that pumpkins produce. I couldn't understand why I had so many flowers and no pumpkins setting on. Eventually they did; and I had something for the grandchildren. A vine may have a lot of male flowers and only one or two female flowers. Pumpkins take up more than there share of space with the big leaves and long vines; but are a lot of fun to raise. They are pretty, too; I like the vines and the flowers a lot, whether I get pumpkins out of them or not. The vines grow like topsy! I'd leave for work and the vine would be to here, and come home to find that it had grown so much it reached over there. <<Jack Pumpkinhead is a fictional character from the Oz book series by L. Frank Baum. Jack first appeared in The Marvelous Land of Oz. Jack's tall figure is made from tree limbs and jointed with wooden pegs. He has a jack o'lantern for a head which is where he gets his name, however unlike most jack o'lanterns, the seeds and other pumpkin guts were not removed. Jack was made by a little boy named Tip to scare his guardian, an old witch named Mombi. From Mombi's chest he took some old clothes for Jack; purple trousers, a red shirt, a pink vest with white polka dots, and stockings, to which he added a pair of his shoes. However, instead of being frightened, when Mombi saw Jack she almost smashed him to pieces, but then she decided to test her new Powder of Life on him. The powder worked and Jack came to life. Even Mombi was not without a curious interest in the man her magic had brought to life; for, after staring at him intently, she presently asked: "What do you know?" "Well, that is hard to tell," replied Jack. "For although I feel that I know a tremendous lot, I am not yet aware how much there is in the world to find out about. It will take me a little time to discover whether I am very wise or very foolish." In The Road to Oz, Jack has settled in a large pumpkin-shaped house near the Tin Woodman's castle in Winkie Country. Jack spends much of his time growing pumpkins to replace his old heads, which eventually spoil and need to be replaced. Apparently, Princess Ozma carves new heads for Jack when necessary. The old heads are buried in a graveyard on his property. It should also be noted that Jack calls Ozma his mother. In The Emerald City of Oz it is revealed that Jack designed a five story, jewel-encrusted, corn-shaped mansion for the Scarecrow. Jack had to wait until the 23rd Oz book to get a book named after himself along with the starring role. Jack Pumpkinhead of Oz was written by Ruth Plumly Thompson, the writer who continued the Oz books after the death of L. Frank Baum. In the book, Peter (the little-boy baseball pitcher from Philadelphia), while reminiscing about his previous visit to Oz, suddenly finds himself landing right into Jack Pumpkinhead's front yard in the Winkie Country. Peter and Jack set off together for the Emerald City, but take a wrong turn, ending up traveling through the Quadling Country. At one point in the book, Peter combats darkness by lighting a candle and placing it in Jack's empty head. Jack notes that it makes him feel "brighter," but also "A little light headed." The only REAL Oz books are BAUM Oz books. OTHELLO: Ah BAUMy breath, that dost almost persuade. What I enjoy about growing pumpkins is that, like most gords, they will grow into most shapes. Sometimes I like to place the young pumpkin gord into a bucket or a hard sided box and it will grow into that shape. BMAONE23 wrote: What I enjoy about growing pumpkins is that, like most gords, they will grow into most shapes. Interesting BMAONE23; I may try something like that next year! I never Knew it but I've heard that butternut squash is what is canned for making pumpkin pie.http://www.thekitchn.com/thekitchn/ingr ... -of-069123 In some places butternut squash is called butternut pumpkin. Butternut squash is great baked and served with real butter and pumpkin pie spice or cinnamon. If you wish, you can add a little brown sugar. 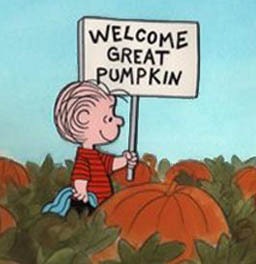 The Great Pumpkin is the only pumpkin GORD that I am aware of. <<A GOURD is a plant of the family Cucurbitaceae, or a name given to the hollow, dried shell of a fruit in the Cucurbitaceae family of plants of the genus Lagenaria. Most commonly, gourds are the product of the species Lagenaria siceraria (the calabash or African bottle gourd), native to Africa, and at a very early date spread throughout the world by human migrations. This species may be the oldest plant domesticated by humans. Recent DNA analyses of bottle gourds found at several sites throughout the Americas has resolved a long-standing mystery. As the bottle gourd is native to Africa and not the Americas, archeologists previous to the analyses could only speculate that it had probably floated across the Atlantic. But upon examining the DNA, they found that the American samples most closely matched the varieties of the African bottle gourd found in Asia, not Africa. It was thus concluded that the bottle gourd had been deliberately brought by early migrants from Asia to the Americas, at a time pre-dating the domestication of plants for food anywhere on Earth. Generally, gourds are used more for utilitarian uses than for food. Only a few varieties are harvested for consumption, mostly in Asia. The shell of the gourd, when dried, has a wooden appearance. Gourd "wood" is essentially cellulose that has no grain. Gourds were the earliest plant species domesticated by humans and were originally used by people as containers or vessels before clay or stone pottery, and is sometimes referred to as "nature's pottery". The original and evolutional shape of clay pottery is thought to have been modeled on the shape of certain gourd varieties. Gourds are also used as resonating chambers on certain musical instruments including the berimbau and many other stringed instruments and drums. Instruments of this type are fairly common to the Caribbean. Birdhouse gourds are commonly used in southern USA for group housing for purple martins, which reputedly help control mosquitoes. It has also been found that gourd skins were used to replace missing portions of skulls in Neolithic times as part of surgery. This is seen as evidence of prostheses made of very fine gold sheet and gourd skins, which were inserted in the skull under the skin or to cover the hole left by the operation. Gord Gourd twixed by spellcheck again...Fast fingers skipped the "u"
there was a giant moth sipping nectar from my wife's Hosta Flowers. It was very colorful and the body was very thick. I thought maybe a Gypsy Moth; but looking at images of Gypsy Moths showed a lot less color. It's wings were flapping almost as fast a humming bird's. orin stepanek wrote: there was a giant moth sipping nectar from my wife's Hosta Flowers. It was very colorful and the body was very thick. I thought maybe a Gypsy Moth; but looking at images of Gypsy Moths showed a lot less color. It's wings were flapping almost as fast a humming bird's. That's most likely what we Easterners call a Humming Moth - for obvious reasons. To find the Truth, you must go Beyond. They are kinda cute - aren't they?? Thanks owlice! They are VERY cute! Don't you wish you could pet one?